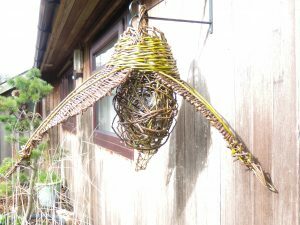 New Willow Basket Sculpture Days update! Places available April - August. 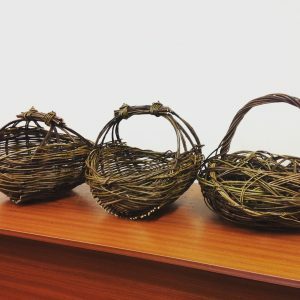 Having now taught 2 of my new Willow Basket Sculpture Days at Coates English Willow I wanted to let you know more about these workshops and show you the amazing results so far! There are currently a few places remaining available for my April – August dates. Have a read of my news below and why not join me to make one of these lovely baskets this Spring/Summer?! I’m always filled with a mixture of much excitement (and a little nervousness!) when teaching a new workshop for the first time. I’m ambitious when creating new Sculpture Days, wanting those who attend to have by the end of our day together created a basket that they hadn’t believed possible to make when they made that first willow hoop at 9.45am. I want everyone to feel their own sense of achievement and enjoy the camaraderie as much as I do! 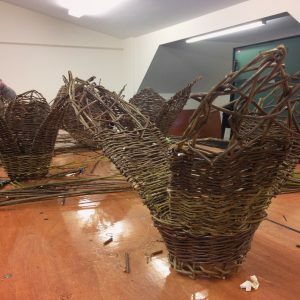 In January I led my first Basket Sculpture Day at Coates. 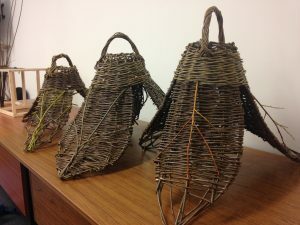 Being me, I offered not 1 but 3 different methods of making a decent sized sculptural basket in a day! 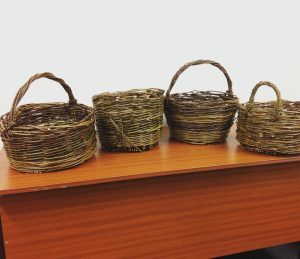 Offering different methods enables me to tailor each basket to their creator. Have they already made willow animals with me and like being very free form? Then go for a free-weave basket. Do they like the idea of doing a stake and strand method but are concerned that they wouldn’t reach perfection first time? Then go for my newly developed playful stake and strand method. Having taught myself back in the Autumn to make Zarzo baskets I also realised how striking and satisfying these are to make in a day and so chose to include this third option too! 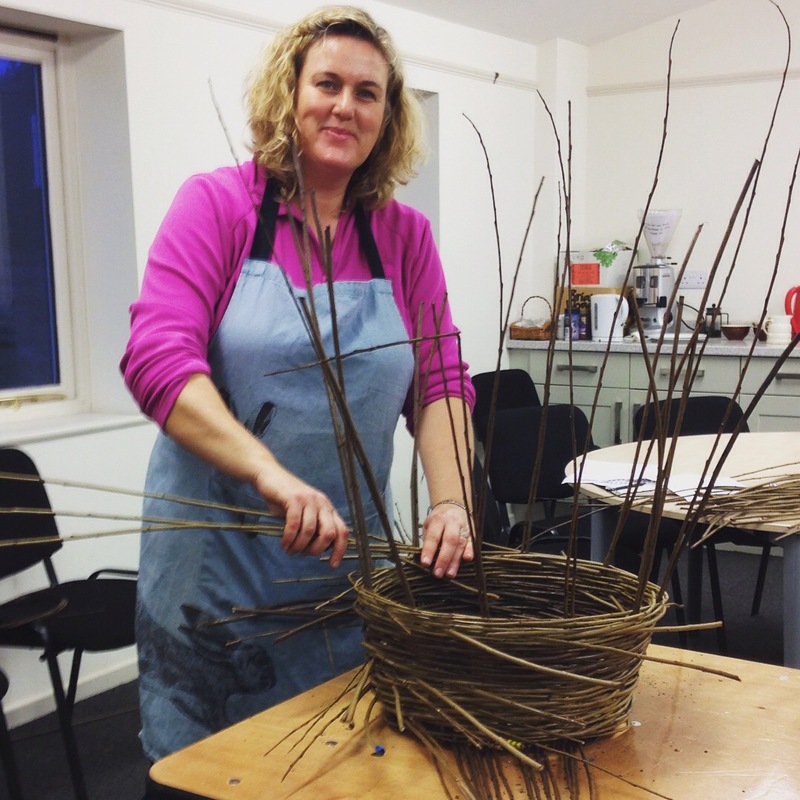 “I attended your first Willow basket making course on Friday 12th January. It was magic! I had such a lovely day and so enjoyed myself and was totally delighted with my basket which sits very happily by my log burner. It was an absolute delight to be taught by yourself and Tam x” Kerry. “Thank you for the wonderful day making baskets on Friday. I very much enjoyed it. You were right about it being a tiring day. If I was so exhausted, what must it have been like for you. With all your energetic input? Thank you again and wishing you a very happy basketing life” Caroline. 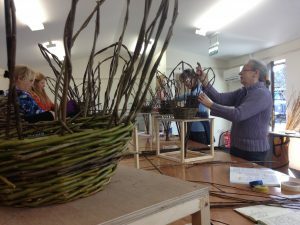 I led the second new Basket Sculpture Day, making Willow Flower Lanterns, last Friday. Again, such a brilliant day! Having devised how to make these Flower Lanterns last Summer, it was so good to finally be teaching how to make them. 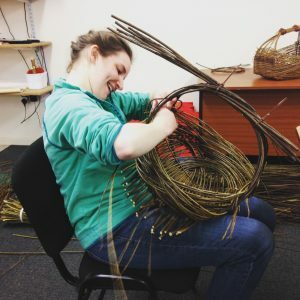 It was so great to have everyone learning basketry techniques such as a 3 rod wale and how to make handles whilst making their beautiful large lanterns. I loved the energy of this day, how the group enthusiasm carried everyone through and how the creative ideas that emerged from students enhanced my teaching and kept me buzzing! One of my students, Caroline sent me a lovely email saying how much she enjoyed the lantern day and included a photo of the finished lantern hanging outside her front door. There are still a few places available for my April – August. For current availability go to my Courses page and fill out the ‘Making an Enquiry’ online booking form. I look forward to making sculptural baskets with you soon! Sarah X.